In memory of my beautiful friend Kate who tragically died this week. I'm so very sorry to hear this sad news, but this is a beautiful portrait. I'm very sorry for your loss. This is a beautiful tribute. I am sorry for your loss! Thankyou for your kind words.. 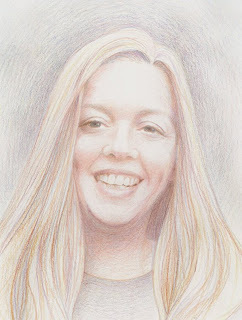 I have given the portrait to Kate's family, my thoughts are with them at this difficult time. What a beautiful portrait of your friend! A wonderful tribute. As always, thinking from your heart. I came to see if you had done the fourth image for your Owl and Pussycat series, and browsed a bit, and saw Kate's portrait. It's lovely, and I'm sure her family adores it, and you. I'm sure you miss her everyday. God Bless both of you.